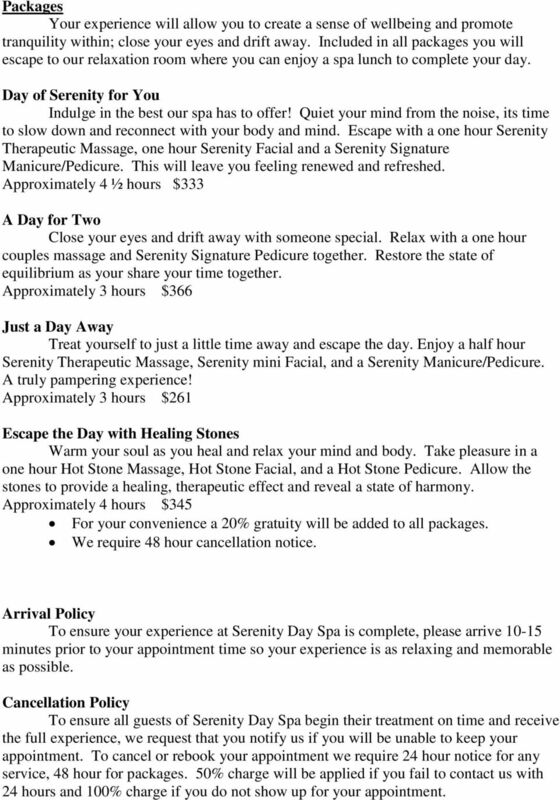 Download "Serenity Day Spa. Waxing Treatments Facial $27 Eyebrow/Lip $20. Chin $10 Chest $55. Back $60 Full Arm $35. Half Arm $25 Underarm $20"
5 Packages Your experience will allow you to create a sense of wellbeing and promote tranquility within; close your eyes and drift away. Included in all packages you will escape to our relaxation room where you can enjoy a spa lunch to complete your day. Day of Serenity for You Indulge in the best our spa has to offer! Quiet your mind from the noise, its time to slow down and reconnect with your body and mind. Escape with a one hour Serenity Therapeutic Massage, one hour Serenity Facial and a Serenity Signature Manicure/Pedicure. This will leave you feeling renewed and refreshed. Approximately 4 ½ hours $333 A Day for Two Close your eyes and drift away with someone special. Relax with a one hour couples massage and Serenity Signature Pedicure together. Restore the state of equilibrium as your share your time together. Approximately 3 hours $366 Just a Day Away Treat yourself to just a little time away and escape the day. 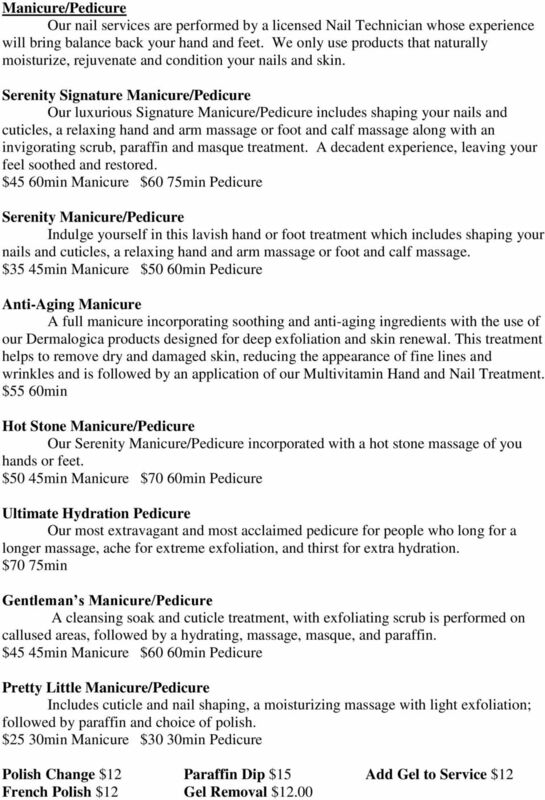 Enjoy a half hour Serenity Therapeutic Massage, Serenity mini Facial, and a Serenity Manicure/Pedicure. A truly pampering experience! Approximately 3 hours $261 Escape the Day with Healing Stones Warm your soul as you heal and relax your mind and body. Take pleasure in a one hour Hot Stone Massage, Hot Stone Facial, and a Hot Stone Pedicure. Allow the stones to provide a healing, therapeutic effect and reveal a state of harmony. Approximately 4 hours $345 For your convenience a 20% gratuity will be added to all packages. We require 48 hour cancellation notice. Arrival Policy To ensure your experience at Serenity Day Spa is complete, please arrive minutes prior to your appointment time so your experience is as relaxing and memorable as possible. Cancellation Policy To ensure all guests of Serenity Day Spa begin their treatment on time and receive the full experience, we request that you notify us if you will be unable to keep your appointment. To cancel or rebook your appointment we require 24 hour notice for any service, 48 hour for packages. 50% charge will be applied if you fail to contact us with 24 hours and 100% charge if you do not show up for your appointment. SPA MENU THE SPA AT THE DIPLOMAT TAKE TIME FOR YOURSELF MASSAGES HOT STONE Traditional Swedish massage incorporating hot stones that penetrate deep into your muscles to relieve tension and promote circulation. AWAKEN YOUR SENSES. For a better you. 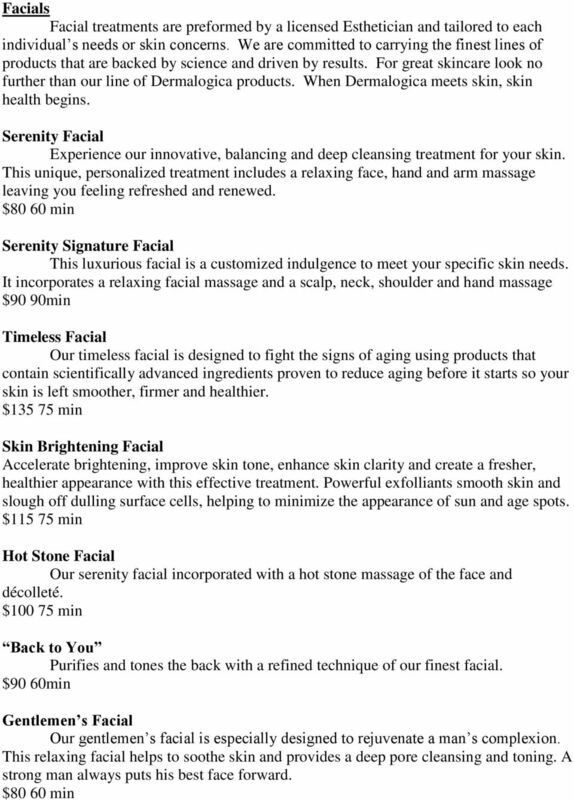 To schedule your appointment, please contact the Spa at 954.602.8400. 1 Touch Therapy 70 mins Touch Therapies 80 mins All Touch Therapies 90 mins Touch Therapy& Back Massage 110 mins 69. Enrich the mind, Nourish the body, Soothe the spirit. A Vacation From Your Vacation Tranquility at the Great Escape Lodge has a SPAce for you to genuinely escape. Our spa offerings have been designed to cater to your desire to achieve a deeper sense of well-being. At Prestige Beauty and Hair, we provide bespoke treatments tailored to the individual requirements of our clients. 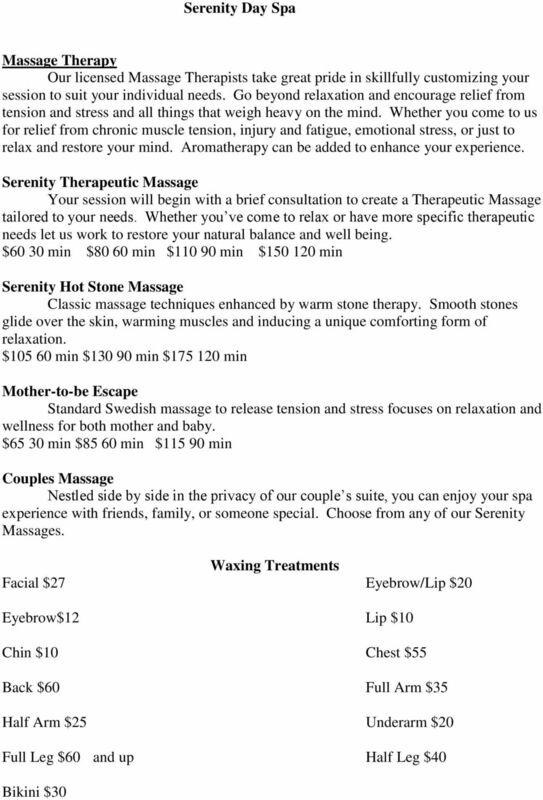 TREATMENT MENU ATLANTA MASSAGE SIGNATURE RELAXATION MASSAGE Our therapeutic, de-stressing massage. 60 minutes $190 90 minutes $190 DEEP TISSUE MASSAGE A firm massage designed to release deep muscle tension. The Spa at Argosy. Serenity has arrived. Step inside and feel the difference. Arriving 20 minutes prior to your scheduled appointment allows time for you to relax and unwind before your treatment. MAKE-UP. Makeup application. 25. False Eyelashes from. 10. Wedding planner and girls nights arranged! Call out service available. FACE MAKE-UP WAXING Microzone Ideal facial to help brighten & freshen the skin leaving you with a radiant glow. Designed to treat prematurely ageing skin by improving skins texture, tone and elasticity. Take your senses on holiday and allow yourself the luxury and opportunity to visit the Lesante Wellness & Spa. Avaton Spa invites you into a world of relaxation and wellbeing! Treatment Menu FACE. Powerful lifting techniques target sagging jowls, cheeks, chin and neck for the ultimate lift effect. Treatment Menu FACE ELEMIS ADVANCED ANTI-AGEING FACIALS These superior face treatments are further enhanced by luxurious hand, arm and scalp massage sequence for the ultimate in scientific skin therapy. TREATMENT MENU. Come hide away in our secret place... Shhhhh no one will find you here! the wellness spa at santai is a haven of relaxation and rejuvenation. SPA PROTOCOL SPA TREATMENT PACKAGES. How can I choose the right therapy? When should I arrive at the Spa? Welcome to Secrets. How should I dress? VJW Holistic T herapies Health & Beauty Spa. Price List. MASSAGE THERAPY. Hot Stone Massage This re-energising stone therapy massage creates a cleansing, harmonising and relaxing effect on your body. Sport Massage 60 mins 1,750 A deep tissue massage that combines all the other forms massage to relieve tightened muscles. SPA PROTOCOL. How can I choose the right therapy? Tea Tree Spa Indulgence 3 Days in Paradise Enhance your holiday with a collection of spa treatments which is created for spa lovers. Enjoy the ultimate Tea Tree experience for pampering and relaxation. 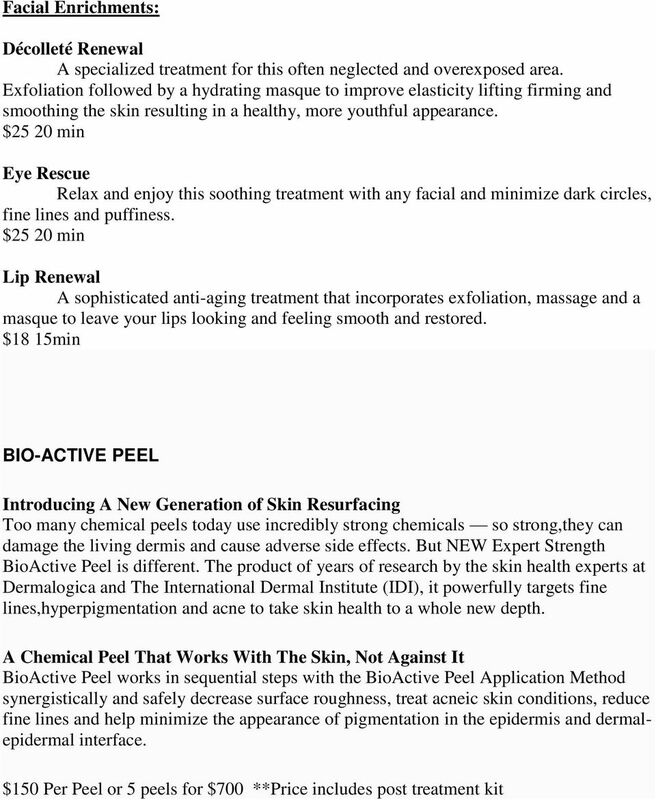 Basic Therapy 60 80 A deep cleaning is essential to recover your skin smoothness and remove blackheads and dead cells. For all skin types. We offer relaxing and nurturing spa treatments for the face and body. Enter a peaceful haven where mind, body and spirit unite. Janet Vaughan. Holistic and Beauty Treatments C.I.B.T.A.C., I.H.B.C., I.I.H.H.T., V.T.C.T., M.F.H.T. Foot Health Professional M.C.F.H.P., M.A.F.H.P.